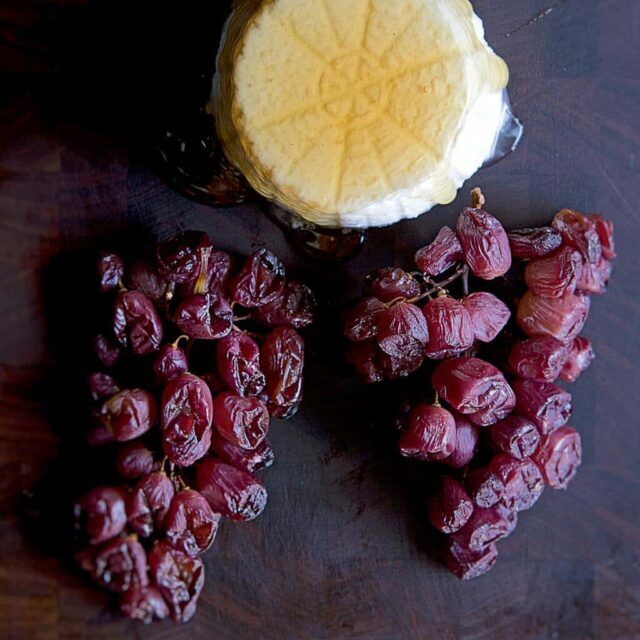 Learn how to make the simplest, most elegant accompaniment to a cheese plate with Oven Roasted Grapes on the Vine. 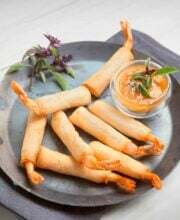 Serve with fresh ricotta drizzled with honey, brie, smoked cheeses! 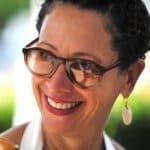 Nancy Silverton bio: Nancy Silverton is the co-owner of Osteria Mozza, Pizzeria Mozza, Chi Spacca, and Mozza2Go, in Los Angeles, Singapore, and Newport Beach, California. She is the founder of the La Brea Bakery and is the only chef ever to be awarded both the Outstanding Chef and Outstanding Pastry Chef awards from the James Beard Foundation. Silverton is the author of nine cookbooks, including The Mozza Cookbook, A Twist of the Wrist, Nancy Silverton’s Sandwich Book, Nancy Silverton’s Pastries from the La Brea Bakery (recipient of a 2000 Food & Wine Best Cookbook Award), Nancy Silverton’s Breads from the La Brea Bakery, and Desserts. 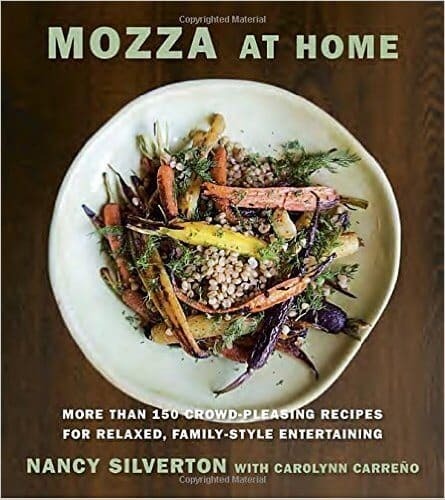 Her newest book, Mozza At Home features 150 recipes categorized into 19 menus for entertaining at home. The dishes are no-fuss, and many of them, like this one for Oven Roasted Grapes, are deceptively simple. I love that the book features dinner party menus – for each, Nancy provides one main course, and several antipasti, salads and side dish options. 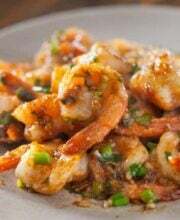 Each of these menus is meant to be family-style – nothing intricately plated, no fancy restaurant gadgets needed, and nothing needs to be served piping hot. As you can see, I’ve been on a big beef streak at the Steamy Kitchen household! If you love to entertain, I can’t recommend this book enough. Everything about Mozza At Home is relaxed, unrushed. I’ve read every single page of this book, fascinated with Nancy’s philosophy of enlisting guests to help prepare the meal, and how she pairs complementary (and contrasting!) flavors and textures. If you have time, read the entire Introduction chapter of the book over at Amazon.com. This method of preparing and presenting grapes is a perfect example of the simple magic that happens when you put something in the oven. Of course, grapes are delicious just as they are, and you can eat or serve them without doing anything more than rinsing them. But roasting them transforms the grapes into something unusual and eye-catching. Roasting intensifies the flavor of the grapes by drawing out the liquid, so they taste like a really fresh raisin. And it gives them a different kind of beauty, like the beautiful patina of old silver. 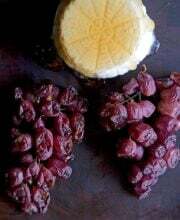 These grapes could find their place on almost any table except that of a Mexican or chili-themed party, and they make a stunning and delicious accompaniment to fresh ricotta drizzled with honey, or on any cheese board. This preparation will yield a delicious result using ordinary supermarket grapes, but will be even better made with grapes found at farmers’ markets, such as Thompson seedless, pale multicolored muscat, or super-sweet Concord grapes. Use this method to roast as many bunches of grapes as you want. Adjust an oven rack to the middle position and preheat the oven to 350F. Put the grape bunches in a single layer on a baking sheet and roast them for 45 minutes to 1 hour 15 minutes, until the skins are blistered and the grapes look like they are one-third of the way to becoming raisins. The time varies depending on the size and variety of grapes you use. If you're roasting more than one variety of grapes, keep them separated on the baking sheet so you can remove each variety as it's done. remove the grapes from the oven and carefully take the grapes from the baking sheet and lay them out on a pretty cutting board or platter. 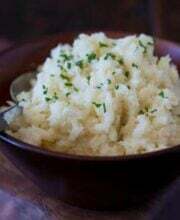 Serve on their own, with fresh ricotta, with honey, or with a selection of other cheeses as well. I had no idea one could roast grapes – Thank you for sharing this. Waste of time. All burnt. Oven was on lower temp 320F, only 35mins, grapes medium to large size, middle of oven. I roasted grapes last night and served this with cheese – it was a big hit! Roast until blistered grapes 350F, don’t eliminate the nutrients? Hi Saran, cooking fruit can decrease some of the vitamins, but not all! Just eat a few more roasted grapes. This is great ! Just great ! If I add some walnuts ……. Perfect ! Thank you !